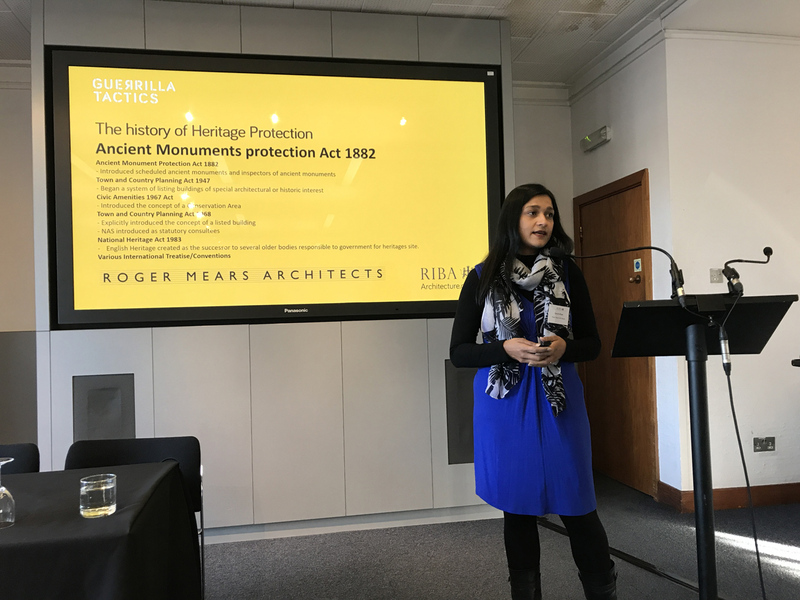 Sarah Khan presented ‘What you need to know about Listed Building Consent’ on CPD day at ‘Guerrilla Tactics 2018: Expanding Practice: Navigating the Architecture of Planning, Procurement and Property’, which took place at the RIBA on 13–14 November 2018. The talk was aimed at architects new to working with Listed Buildings. The talk began with History of protection for Heritage Assets, and then moved on the new developments for Listed Building Consents. It touched on the RIBA plan of work and Conservation overlay. She also explained how best to approach Heritage Statements. Finally, there was also a discussion of how to deal with enforcement action. This event was RIBA CPD certified.